There are other options, of course, mostly involving sprays that work to varying degrees. 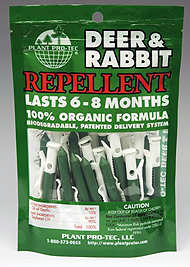 The Orcon deer and rabbit repellent product is one of the best, a highly concentrated garlic oil contained in a unique plastic container that keeps the product effective up to six months, even after rain. Gardeners report very good success with the product, as it overcomes the biggest reason most sprays and granular treatments are not effective: gardeners don’t stick with it. For more information, and to order, click here. If you buy some and try it this coming season, be sure to report back to me. And to answer the first question, after the show I’m going back to the Country Inn and Suites, sitting in bed in my underwear, eating chips, drinking G2 and watching ESPN.